5. Grilled Octopus at Honu (Lahaina). 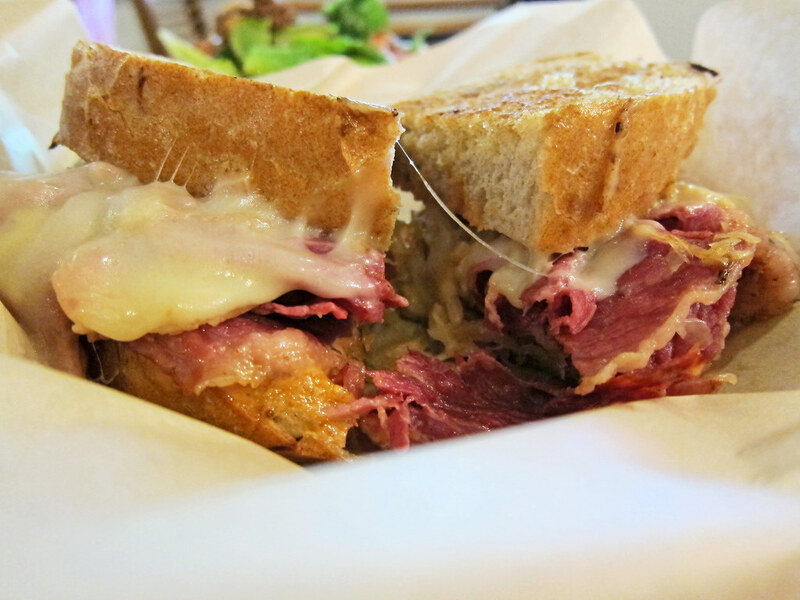 The combination of casual setting, fantastic views and great food is a rare trifecta. Honu hit all three. An open, airy dining room that literally backs right up onto the rocks of the Lahaina coast, Honu bills itself as a "Seafood and Pizza" place, which kind of sells it short. 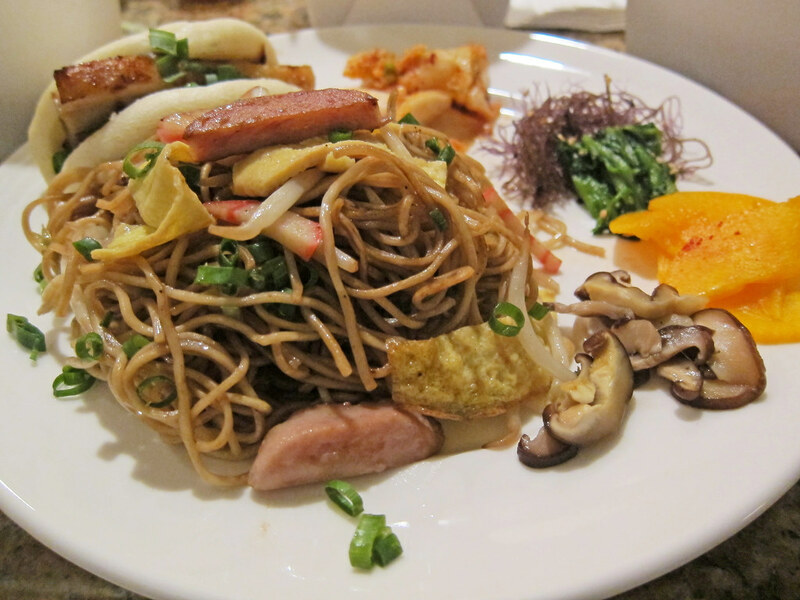 It was probably my favorite meal during our stay on Maui's northwest coast: great ingredients, prepared well, with some creative and well-tuned flavors. 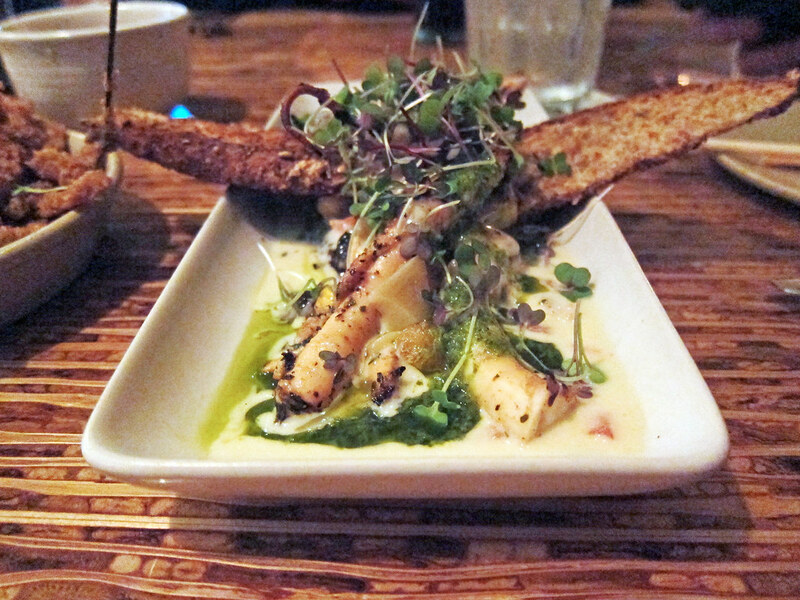 I liked the crispy pig ears with lavender and a Korean-spiced aioli, and the salt and pepper Dungeness crab, but the best dish we had there was an appetizer of grilled octopus, served over a verdant edamame hummus, generously drizzled with a mojo verde and good olive oil, with crusty, earthy flax seed toast for dipping. 6. Tomatoes with Taro Hummus at Merriman's (Kapalua). Peter Merriman was one of the pioneers of the local food movement in Hawaii, who more than 20 years ago started nurturing relationships with local farmers instead of flying in all of his product. 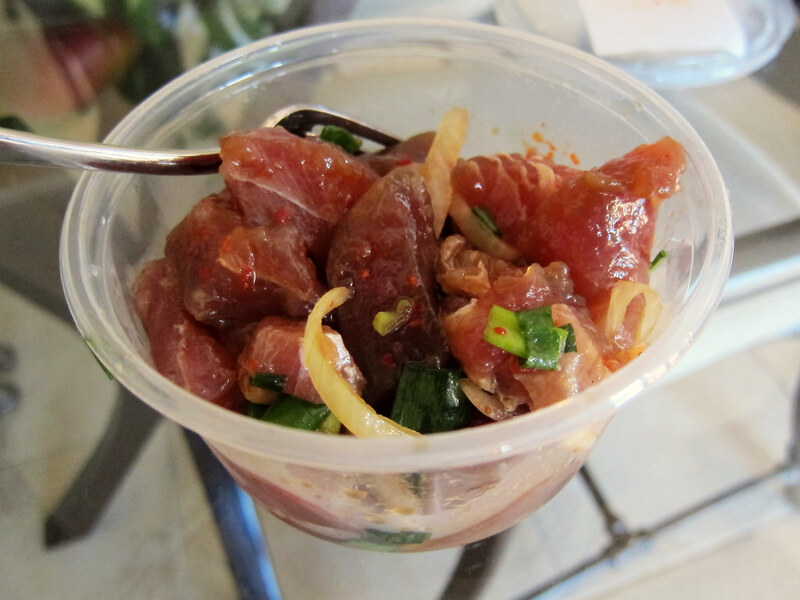 He's parlayed that movement into great success, and now has restaurants on Big Island, Maui and Kauai. His Maui restaurant is part of the upscale Kapalua Resort, and was the most resort-y of the restaurants we tried. The venue was postcard perfect, especially at sunset. The food was - well, kind of touristy and stuck in the 90's: salads with strawberries, macadamia nut crusted fish. But still good, especially the raw ingredients. The best example were the sweet, intense, locally grown cherry tomatoes that were served along with some other vegetable crudités and a cold smoked taro hummus. If I could have just a bowl of those while watching the sun go down over the ocean, I could be very happy. 7. Mopsy's Kalua Pork Pizza & Pele Pesto Pizza at Flatbread Company (Paia). Paia is on the opposite side of the island from Lahaina, up on the north coast, a funky surfing town that also serves as the sort of unofficial gateway of the Road to Hana. 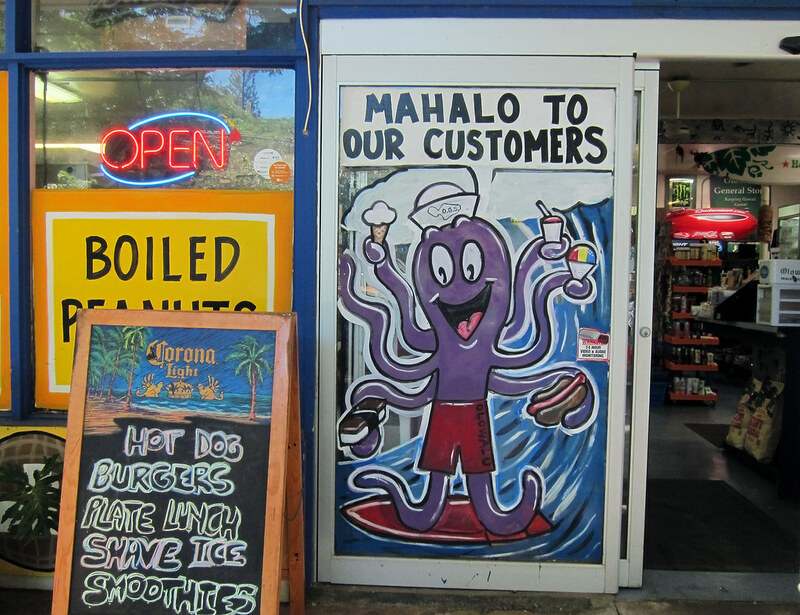 The most well-known restaurant in Paia is probably Mama's Fish House, but we had some driving ahead of us and were looking for something more casual. 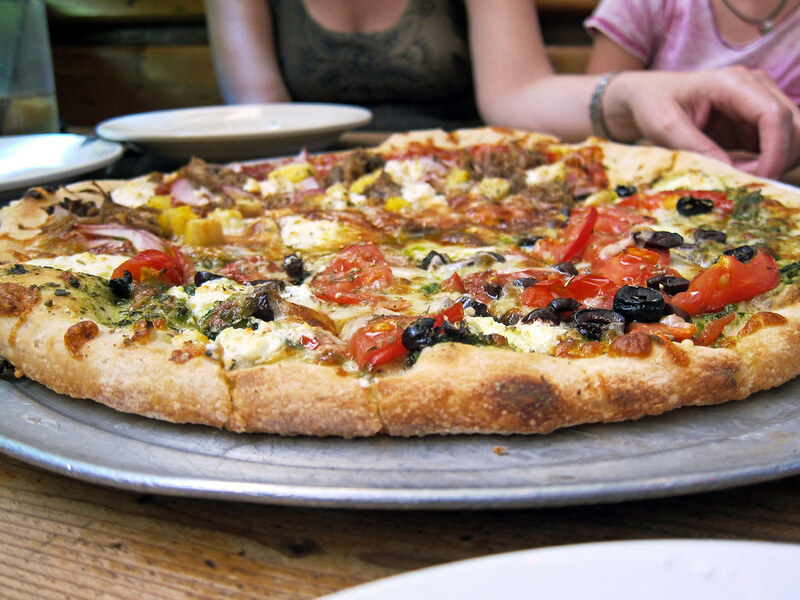 At Flatbread Company, pizzas are baked in a massive wood-burning oven in the very center of the restaurant, and topped with combinations of mostly locally-sourced ingredients. We went half-and-half. One side was Hawaiian style (something I consider sacrilegious unless I'm Hawaii), topped with kiawe wood smoked pork shoulder, Maui pineapple, mango barbecue sauce, red onions, local goat cheese, and mozzarella; the other half was garnished with a macadamia and basil pesto, local goat cheese, mozzarella, basil, tomatoes and kalamata olives. It turned out to be one of those unexpected pleasant surprises, an unheralded place that was much better than anticipated. 8. 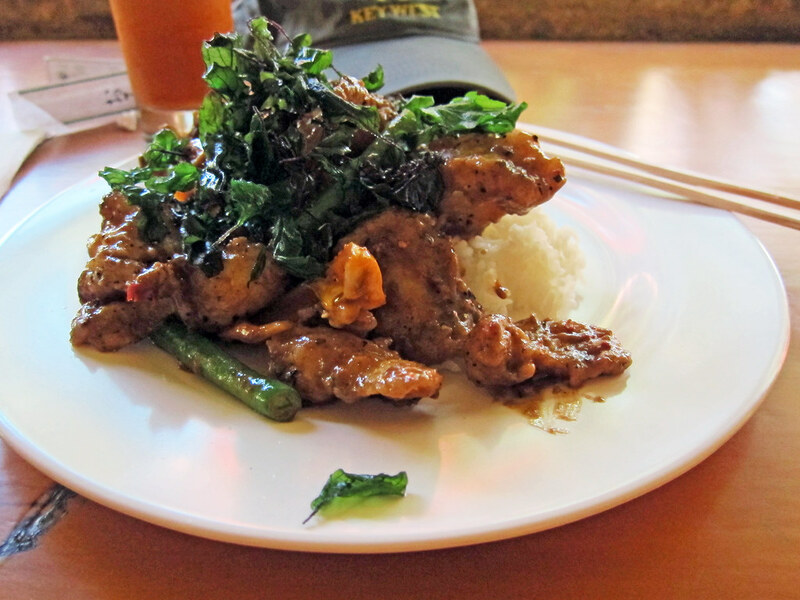 Mahi Mahi with Green Curry at Nutcharee's Authentic Thai Food (Hana). Most people do the Road to Hana as a day trip, with brief stop-offs. The town of Hana and the surrounding area are gorgeous, but somewhat isolated and still pretty undeveloped. We elected to spend a few days there. It turns out there were basically only two actual restaurants in town: the one restaurant in the one (smallish) resort in town, the Travaasa Hana; and the rather uninspiring Hana Ranch Restaurant. The other options are all basically roadside stands - which provided some of the best meals we had the whole trip. 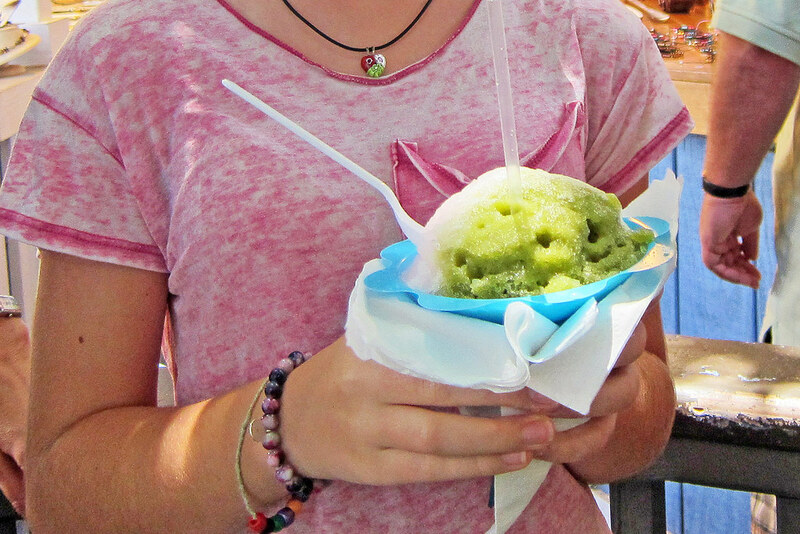 Nutcharee's operates out of a tarp-covered space along Uakea Road, next door to the Luana Spa Retreat and across the street from Ball Park. They're only there certain days of the week, and like most of these places, only during daytime hours. 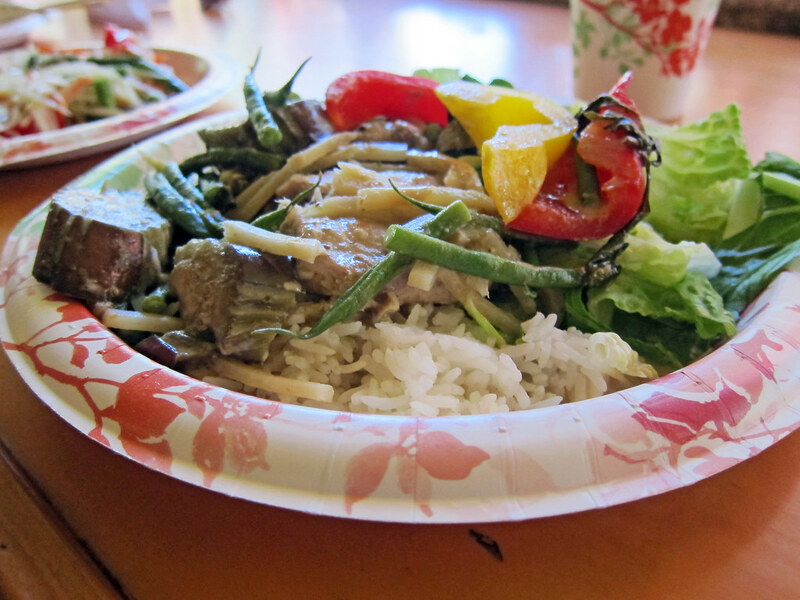 The special of the day -green curry with mahi - was fantastic. Fresh, local fish, the brightness of fresh vegetables (eggplant, green beans, peppers), the zing of curry spice - all served up on a paper plate. 9. Drunken Opakapaka at Thai Food by Pranee. On days that Nutcharee's isn't there, Pranee takes over the same space. I'd be hard pressed to pick a favorite. This "drunken" (a/k/a "kee mao") opakapaka (a/k/a pink snapper), served with long beans and crispy basil leaves, was every bit as good as Nutcharee's green curry mahi, maybe even better. Definitely worth going back to do your own compare and contrast. 10. Potesto Pizza at Clay Oven Pizza. We rented a house while in Hana, anticipating we'd be mostly cooking in at night. 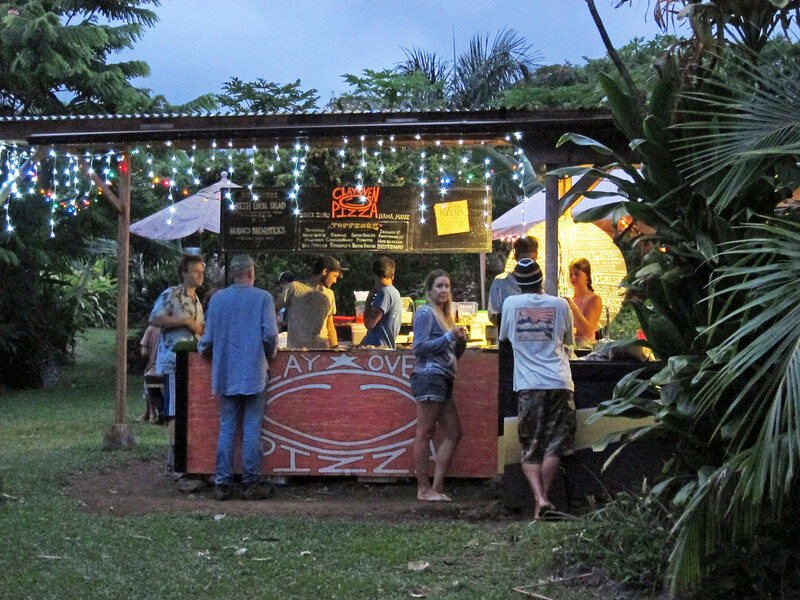 But we were also happy to discover that a couple nights a week, some folks set up shop, fire up a wood-burning outdoor clay oven, and make pizzas in a field near Mile Marker 31 along the Hana Highway, just a bit up the road from the turn-off for Wai-anapanapa State Park. 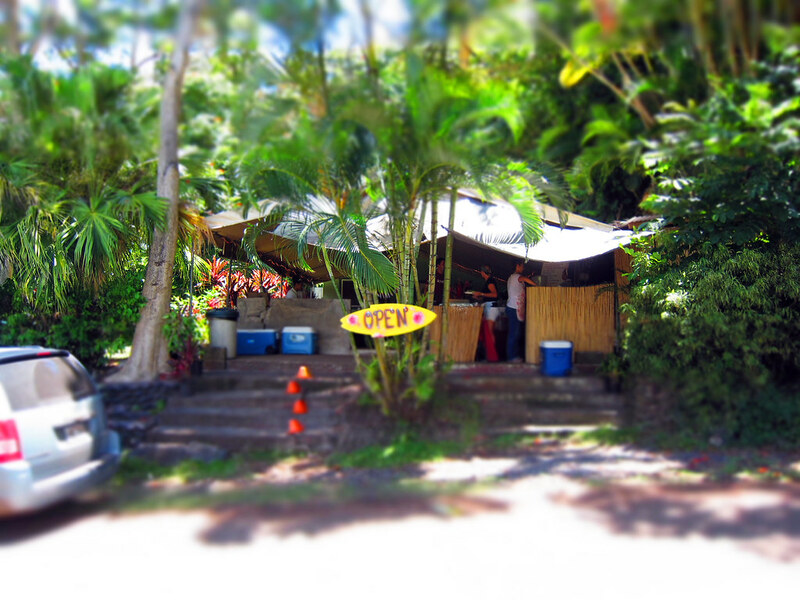 Bring your own beer, and make yourself comfortable on a picnic table nestled in among all the tropical vegetation. They offered nearly a dozen different combinations of toppings, many with locally-grown ingredients, and of those we tried my favorite was the "Potesto" pizza, topped with thin-sliced potatoes, roasted garlic cloves, caramelized onions, pesto, bechamel and parmesan cheese. With its bubble-pocked, charred-in-spots crust, it would have pleased any pizza aficionado. To find it in the midst of one of the most beautiful places on earth - well, that was a real treat. The rest, actually, were somewhat disappointing. The Hapa Ramen came in a murky, greyish-purple broth with no distinct flavor, and the Star Udon with roast pork were bland. We picked up take-out, so perhaps the travel was part of the cause. Nearly every convenience store in Maui had dried mango strips dusted with this li hing mui powder - if anyone knows where I can score some of the stuff locally, please speak up. I recently had breakfast at Sarentos On The Beach in Maui. The food was great, and of course the view was also amazing. 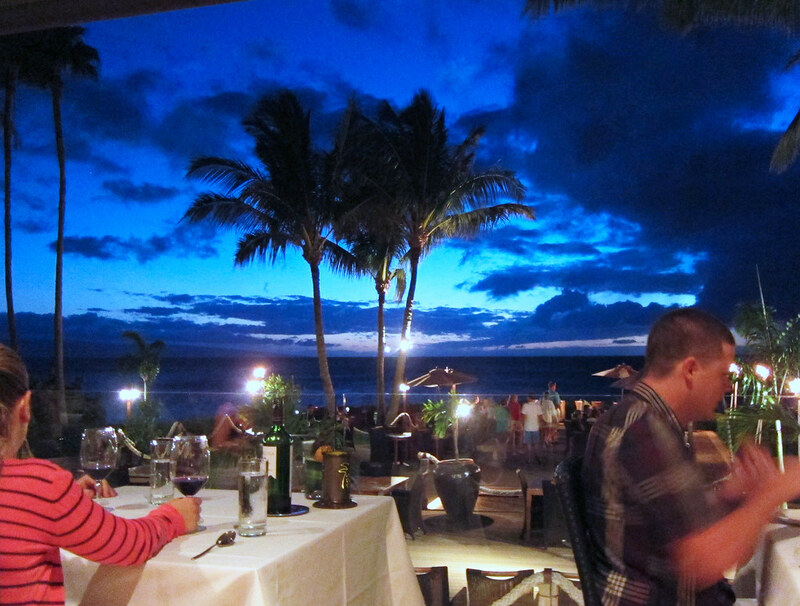 From your picture, Honu looks like a great place to spend an evening.